National Volunteer Week (April 15-21) is a great time to start volunteering – and to get the whole family involved. Volunteers of every age are needed all year, every year! It’s never too early to start instilling a spirit of volunteerism in the next generation. The key is to match the activity to the child’s age and interests. Children as young as two can help pick up trash. Four-year-olds can help assemble blessing bags (with essentials such as toothbrushes and socks) for the homeless. Elementary school kids are becoming aware of the needs of others and may choose to volunteer at animal shelters or soup kitchens. Just remember to check the requirements of any organization you seek to support through your family’s volunteerism. The organization may ask you to volunteer alongside of your kids in order to supervise. High-schoolers can earn community service hours by volunteering in their communities or even dedicate a school break to traveling to another country to build houses or feed impoverished families. Many international nonprofits organize service trips. 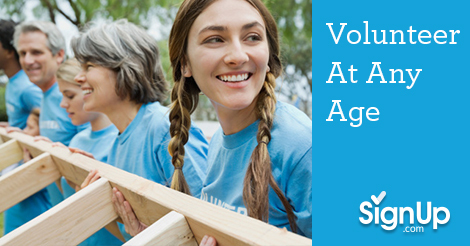 During your 20’s, 30’s and 40’s, choose volunteer opportunities that fit in with the demands of work and family. For example, if your job requires you to act in a leadership role, you might choose to volunteer as a worker bee —fulfilling a defined task such as delivering meals to shut-ins or sorting food at the Food Bank. If you have extra time, consider getting involved in the administration of a nonprofit as a Board Member. To busy to volunteer at all? You might consider supporting a favorite cause financially and sharing the organization’s mission through social media. Once your 50’s roll around, as your schedule frees up through empty nesting or retirement, look to AARP for additional opportunities. Why not join the award-winning Driver Safety program, where volunteers become driver safety instructors, teaching the AARP Smart Driver classroom curriculum. AARP Driver Safety volunteers are trained and provided with curriculum materials. They report a high level of satisfaction from knowing that they are saving lives in their communities. Click here for more information. You can also change lives through the AARP Foundation Experience Corps, an intergenerational volunteer-based tutoring program designed to teach reading to children who aren’t reading at grade level. Many students who work with Experience Corps volunteers show as much as 60% improvement in critical literacy skills compared to their peers. Become a literacy volunteer by filling out the application here. AARP recognizes that a make a regular, long-term volunteer commitment does not work for everyone. That’s why they established Create the Good, a program that matches participants’ talents, interests and time with volunteer opportunities in their communities. Volunteers can complete a profile detailing their interests or just search the opportunity database by zip code. Nonprofit organizations that need volunteers can post their opportunities directly to the website. Whether you have five minutes or five hours, there is a match for you! Click here to create your profile and find opportunities in your area. Volunteering can be a life-long pleasure. Simply choose the activity that’s right for you and go, go, go!